Later this month there's going to be a live music concert featuring several artists from around the globe, streaming their performances via Internet audio into the world. Free to the public, it'll take place on the private island of Menorca, and the water-borne stage (created by Maczter Oddfellow) is still under construction. But then, that isn't news: live performances in Second Life have become so commonplace, they were recently added as an Event category. What is news is that this particular event is being indirectly sponsored by the Coca-Cola Company, and the corporation's logo that's emblazoned across the awnings is there with the firm's full consent. "We have permission to build it here and use the logo," event coordinator Zenigma Suntzu says, and passes me the name of the Coke marketing director his group communicated with. Zenigma's a longtime volunteer with City Stages, a non-profit performance space in Alabama, and Coke has been a sponsor of the Birmingham venue for some 15 years, he tells me. 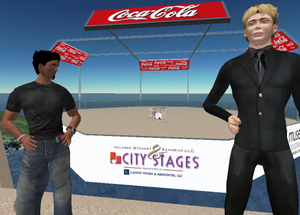 So when Suntzu got City Stages' marketing director to sponsor a concert in Second Life, it was a fairly easy process for him to get the green light from one of their parent sponsors to come along for the upload, too. Of course, well-known corporate logos have made their way into SL before-- but up to now, they've been uploaded by Residents rather lax with the niceities of trademark law. (And when discovered by Linden Lab's policy enforcers, summarily zapped off the servers.) But on April 22, 2006, the most recognized corporate logo in the world comes to this world, with the holding corporation's approval. In Second Life, Zenigma Suntzu is an active member of the Free Culture group, created after Lawrence Lessig's appearance in-world, an SL group working with Creative Commons to promote the non-profit's ideals and principles. (Full disclosure: I'm a proud member of the group myself.) I asked Zen if he was uncomfortable working with such a strictly protected trademark and brand. "No, I believe that there is a freedom of choice aspect of Creative Commons," Suntzu tells me. "So, one can choose to put a work into the Creative Commons, say, asking only for attribution [credit], where other works might be closely held." 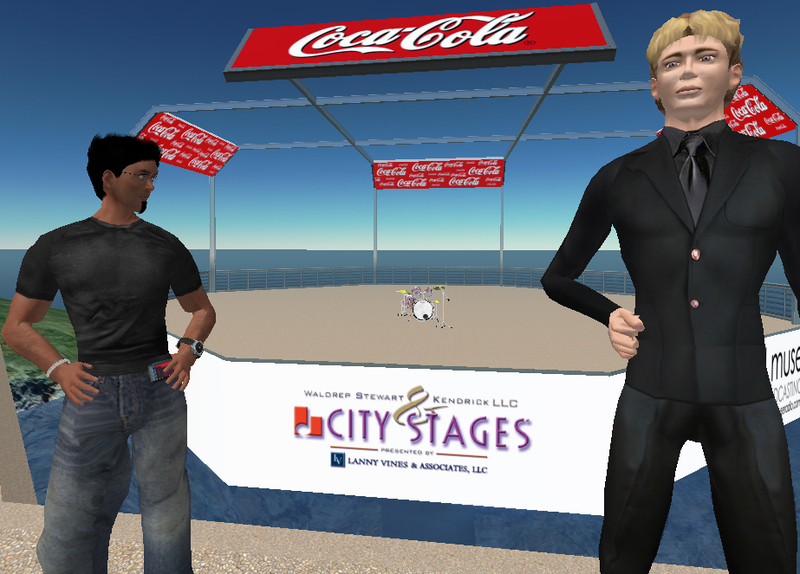 To his knowledge, Coca-Cola has no other plans to display its brand in Second Life, but Zenigma Suntzu does have future ambitions for the Alabama music logo that's also featured on the stage that Oddfellow is still building. "City Stages was among the first festivals to put up a website back in 1995 (or so)," Zenimga says, "and [City Stage's Marketing Director] and I view this as an opportunity to explore new avenues of marketing... trying do to it in the 'right way', working with members of the community to create or support interesting events... [it's] not just a local brand, we draw people from as far away as Australia, so there is the possibility that we'll attract some visitors that might not otherwise have come." And like MTV's first appearance in Second Life a few months ago, another boundary is crossed, for good or ill or both, one more merger of digital utopia with the hard economic reality it depends upon. I would imagine that Coca-Cola have approved the use of their 'mark' in context to the event. This would extend to the events approved channels of communication and marketing. Therefore the 'event' is the brand, with COKE being a sponsor. This is a grey area, something interesting to watch. The interesting thing, I doubt Coca-Cola have a 'chapter' of Virtual World Brand Guidelines. They will have guidelines of how their brand can appear within the context of the live event. 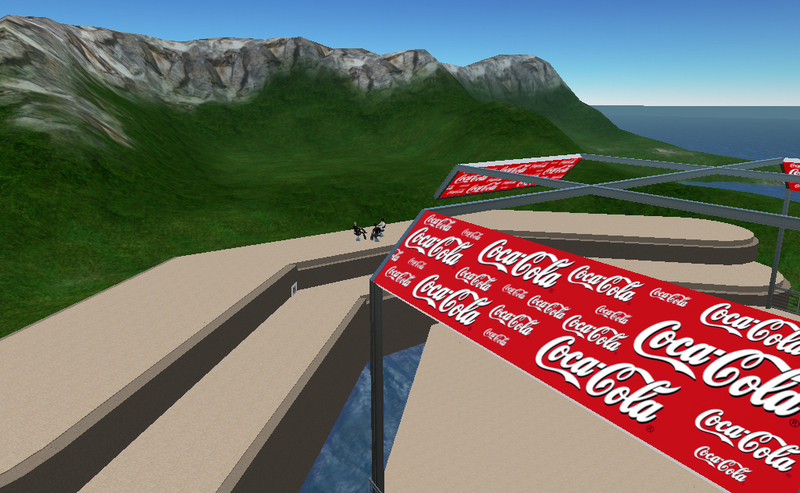 This is not an endorsement of advertising COKE within Second Life. This is simply someone creating a realistic simulacrum of the event - a meta event. hi, Is if Coke is paying anything to the event hosts or if this logo appearance is purely a freebie to the corporation? that's nice work, i am a design student and i love the work that other shares , it is really pretty done job. So when Suntzu got City Stages' marketing director to sponsor a concert in Second Life, it was a fairly easy process for him to get the green light from one of their parent sponsors to come along for the upload, too. No, I believe that there is a freedom of choice aspect of Creative Commons," Suntzu tells me. "So, one can choose to put a work into the Creative Commons, say, asking only for attribution [credit], where other works might be closely held." Pretty sure that suntzu did not say that tinggi. Thanks for posting this. Liked your previous post about jenna fairplay and the VIP hostessing stuff. One of my best friends does this job at a local nightclub, so it definently sounded familiar! It seems you have scanned the whole information about the event and there logos etc as you really put it all in just a single post. Great observation adn suggestion. It seems you have scanned the whole information about the event and there logos etc as you really put it all in just a single post. Thanks.